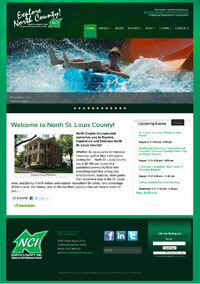 We are proud to unveil our latest website redesign for North County Incorporated. This website, Explore North County, is all about things to do, see and experience in North St. Louis County including events, arts & culture, festivals, historical treasures, museums, recreation, and North County’s vast park system. Dynamically generated maps are featured on each page so it’s easy to find all the great things to do in North County.